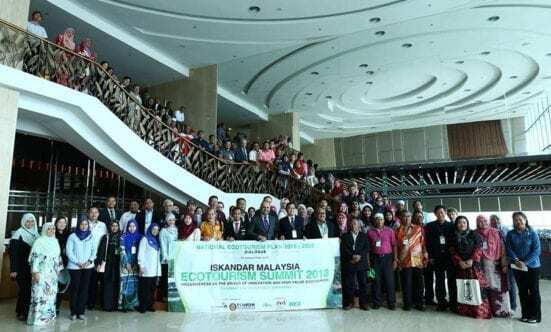 JOHOR BAHRU, 1 Nov. – The Tourism Planning Research Group (TPRG) of Universiti Teknologi Malaysia (UTM) in collaboration with Iskandar Regional Development Authority (IRDA) had organized the 7th Iskandar Malaysia Ecotourism Summit (IMES2018). IMES2018 Chairman, Prof. Amran Hamzah said that the IMES 2018 was aimed at promoting inclusive governance and stakeholder collaboration as the key driver of high value ecotourism. “Our main objective in organizing this IMES2018 was to stimulate discourse and facilitate mutual learning among stakeholders on the need for inclusive governance and collaboration in tourism development. “We also intend to showcase success stories and best practices in the region related to inclusive, competitive and sustainable tourism besides building capacity and motivate local authorities development in their jurisdiction,” said Prof. Amran. The IMES 2018 was held at Holiday Villa, Johor Bahru and was officially opened by Mr. Anwar Asyraf, the representative of Johor Women Development and Tourism Committee Chairman, YB Liow Cai Tung. The IMES2018 also featured four keynote speakers who presented their papers beginning with Mr. Mohd. Daud Mohd Arif, Undersecretary Tourism Policy and International Affairs Division, Ministry of Tourism, Arts and Culture Malaysia giving his keynote address. The first presenter was the owner of Terrapuri Heritage Village and Chief Executive Officers (CEO) Ping Anchorage Travel & Tours Sdn. Bhd, Mr. Alex Lee Yun presenting his paper titled ‘The Intersection between Creative Tourism and Cultural Heritage : The Terrapuri Heritage Village Experience’. Paper No.2 was presented by the Head of Corporate Public Relations and Tourism Division, Majlis Perbandaran Taiping, Hanim Ramly followed suit with the third paper by the President of the Association for the Protection of the Natural Heritage of Malaysia (PEKA) and owner of Tanah Aina Eco-Resort, Puan Seri Shariffa Sabrina Syed Akil. The fourth and last paper were presented by Local Champion Miso Walai Homestay, Kinabatangan, Sabah with the title ‘Upscaling Community-based Ecotourism : Innovation and Inclusiveness in KOPEL Batu Puteh by Mohd Hasim Abd. Hamid. Since its foundation in 2012, the UTM TPRG has conducted over 70 research projects about tourism activity of Malaysia and international. Among its famous project were National Tourism Policy, National Ecotourism Plan, 1Malaysia Home Stay and Johor Tourism Masterplan 2014-2023.